My family moved to Washington State when I was 12. Since then, I have lived in WA and CA. I even felt a couple minor quakes while living in the Bay Area. I should have put together an emergency kit years — decades — ago, but I just never got around to it. A few weeks ago, author Elizabeth Bear tweeted a link to a New Yorker article on the Big One. It finally scared me into action. If the Cascadia fault does bust all the way up to Washington, Port Angeles is going to be in deep trouble. If we make it through the initial quake, there will be a tsunami, and then if we survive that, the whole area will be such a mess that it might be a good long time before we get help. 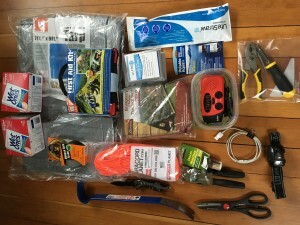 So, properly motivated, I finally went through and put together an emergency kit. With Amazon’s help, I was able to get it done in an hour or so by starting with emergency radios and first aid kits, then looking at the “customers also bought” items. I think this is a nice, solid basic emergency kit, suitable for anyone who is living in an area at risk of a large-scale disaster. The whole thing cost a bit more than $100 . . . not cheap, but if I ever need it, it will be well worth it. Of course, I hope that I never actually need it! If you’re looking forward to put together a kit of your own, feel free to use this as a jumping off point! My focus below is on a non-food emergency kit – but my friend Blair McGregor recently did a nice post on food preparedness. Did I miss anything critical? The most basic requirements have an asterisk; many of the others are nice to have, but not critical. Not pictured. Ideally you would have enough for at least 3 days. Human power pellets or a bunch of canned food . . . Whatever you can actually keep on hand and swap out as necessary. If you have pets, include some food for them — or select canned food that either of you could eat. If you want to be properly prepared with more than a few cans of food, here’s a nice post on food preparedness. This is partially covered under health (water treatment), but in an ideal world you would have actual containers with at least 3 days of water. In an ideal world, you would have some layers, clothes, socks, etc. Take some things that you were planning to take to the thrift store, and stick it in your emergency kit instead. Ideally you would have such things in your car, anyway, so one cheater method is to stash a copy of your car key in your emergency kit, and just keep the clothes in the car. Of course, you better be sure that your car will be home if you are! In an ideal world, you would have a packet of paperwork with copies of your identification, insurance, telephone numbers, etc. You have your handy dandy kit. Now where are you going to keep it? I’m stashing mine in a shed, so that if the house falls down I can still get to it. Wherever you put it, imagine the structure in a heap of kindling. Could you still get to the kit in a pinch? If so, you’re good. 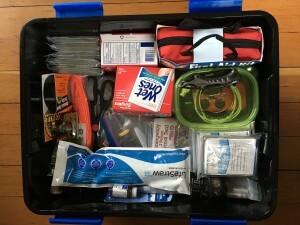 I broke my emergency kit into a compact kit of items that can just live in a plastic bin. I’m keeping the food and water separate, since those are bulky, and need to be swapped out periodically. Even if I get sloppy with the food and water, at least the gear will still be there! And if the big one does come . . . well, I’m going to owe Bear a lot of drinks for spurring me to get my act together. My First New Year’s Resolution! I have never made a New Year’s Resolution. January 1st isn’t an especially good time to start things, at least for me. I’m usually backlogged with work and projects from the holidays. The weather isn’t great. I just want to stay at home and catch up on things. All that said, I am going to break my long-standing tradition and make a New Year’s Resolution. I resolve to update this blog once a week, regardless of what else is going on in my life, for at least the next year. I want to work blogging into my schedule, and this seems like the kind of goal that actually works well with the major January 1st benchmark. There are lots of things that I have been meaning to talk about, but I have a full and happy life. That’s mostly good, but it means that “talking about stuff” tends to fall off the back burner. Anyone want to jump on the bandwagon?